The subtitle to this amazing essay – Sustainable food makes no sense when restaurants pay only sustenance wages – may sound like the beginning of a tirade against the local or sustainable food movement, but it is really about some structural issues in the restaurant business and retailing. Both industries employ millions of people. Very few of those people make a living wage. That career has spanned eleven years, during which I’ve worked as a prep cook, fry cook, pantry cook, grill cook, pastry chef, and baker. The least I’ve made was $7.50 per hour; the most was $13.50. To be a line cook and eventually a chef you must submit to the hell that is the professional kitchen: long hours, low pay, no breaks, no respect. As you advance up the line, the work gets harder and the responsibility increases while the pay does not. An entry level line cook job starts at as low as $8 an hour and tops out at around $15. (In 2011, the national median wage for line cooks was $10.61, according to the Bureau of Labor Statistics.) If you want to make more, you have to advance up to a management position such as sous chef or chef de cuisine. Even then, the pay is going to be around $16 to $18 an hour and is not likely to top $23. I never advanced to the top of the pay scale, mostly because the added hours and stress those jobs demanded never seemed quite worth the pay. The last sous chef I worked under was all-consumed by work. You could see in his leering eyes that he was in a constant state of caffeinated fatigue. I didn’t want that. If people working in the kitchen are to earn an actual living wage, fine dining restaurants will have to charge twice as much they already do. In other words, if I am to be paid enough for me to feel valued as an employee, the cost of dinner is going to have to go way up, to the point where it is inaccessible for the average person — for me — to eat there. When you’re in the industry you get around the hurdle of high prices by knowing people: Your friends at other restaurants “hook you up” or “style you out” when you visit. But there’s no guarantee of being hooked up. I don’t know everyone at every restaurant, and I’m only in luck if Joey happens to be working the night I happen to go out. In the end, affordability and fair pay in the restaurant are mutually exclusive. The only solution to this contradiction that I can imagine is an operation where the money goes directly to the worker: for example, an owner-run food cart, or a fine dining establishment structured as a worker-owned co-op. The food and retail industry would be best served – in terms of doing the greatest good for the greatest number of people if most of it were structured as a co-op. To make that kind of paradigm shift would make herding turtles in a hurricane seem easy. If I started my own restaurant – that is a common conservation topic – i would not mind at all structuring it so that employees from dishwashers to wait staff to cooks become part owners. To have a self directed staff – where as much as possible the chain of management is flat – not like the current very steep pyramid. Maybe I would make a little less money, maybe more, who knows, over the life time of the business. In the interim everyone involved got to have a life. They get to take pride in what they do, be self motivated and largely self directed and reap the rewards. I can’t take the money with me, but I could leave a nice humanitarian capitalism legacy. 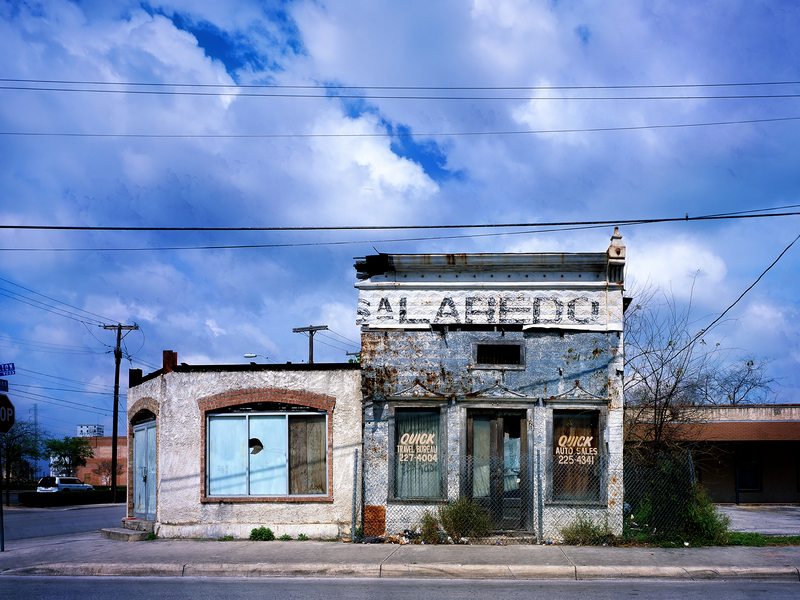 abandoned travel agency, san antonio, texas by carol highsmith. this photo was taken around 2005. there were some efforts underway to revitalize this neighborhood that was very vibrant back in the 1950s-60s. 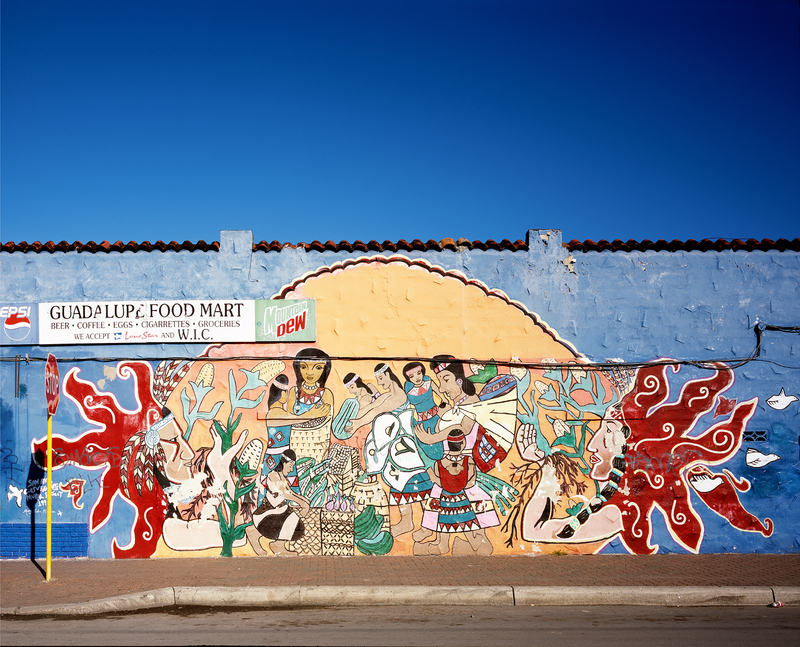 A mural on the side of a grocery store located on the West side of San Antonio, Texas. also by Carol Highsmith. 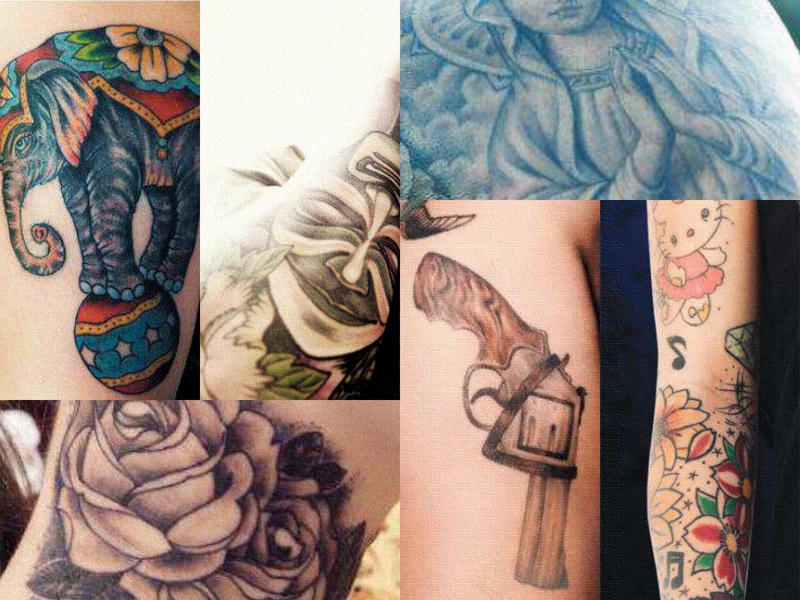 tattoo collage. the individual snips all have a little artsy Photoshop texture and color enhancement. The reality was that the Framers wrote the Constitution and added the Second Amendment with the goal of creating a strong central government with a citizens-based military force capable of putting down insurrections, not to enable or encourage uprisings. The key Framers, after all, were mostly men of means with a huge stake in an orderly society, the likes of George Washington and James Madison. President George Washington, as Commander-in-Chief, leading a combined force of state militias against the Whiskey Rebellion in 1794. The men who gathered in Philadelphia in 1787 weren’t precursors to France’s Robespierre or Russia’s Leon Trotsky, believers in perpetual revolutions. In fact, their work on the Constitution was influenced by the experience of Shays’ Rebellion in western Massachusetts in 1786, a populist uprising that the weak federal government, under the Articles of Confederation, lacked an army to defeat. As far as I’ve read, the conservative freak-out is all about some modest new restrictions like closing the gun show loop hole and bringing back the assault weapons ban that George W. H. Bush signed into law. While Parry writes a good article I don’t this rational arguments will go far to convince people that worship fire arms the way ancient tribes worships idols. 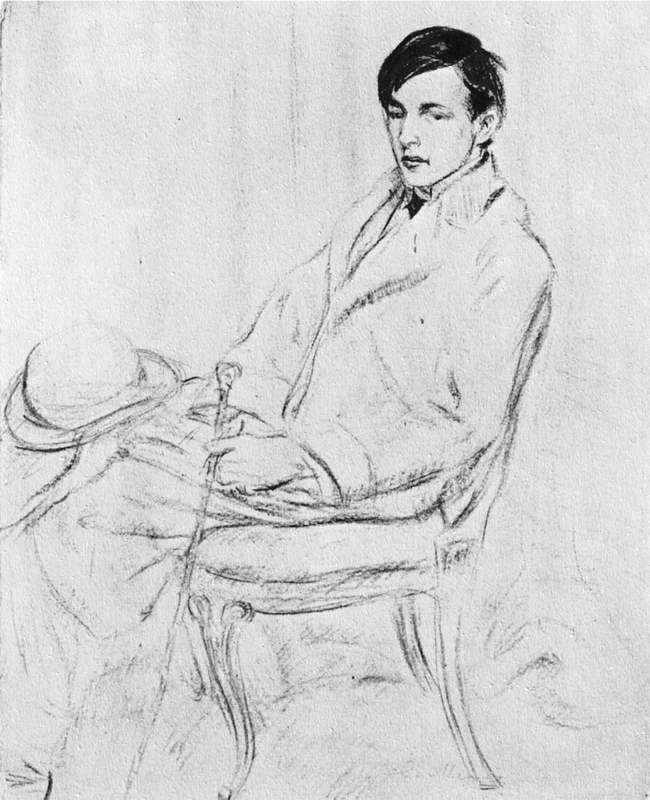 the figure is glacken’s friend everett shinn. the chair in this painting also appeared in another famous painting by glackens called ‘the ermine muff”. i did previously did post that featured some american impressionists. glackens(1870-1930) was part of the next trend, american realism. he and his friend shinn were part of the short lived, though influential Ashcan school art movement. at the shore by a.h. maurer, 1901. oil on cardboard. 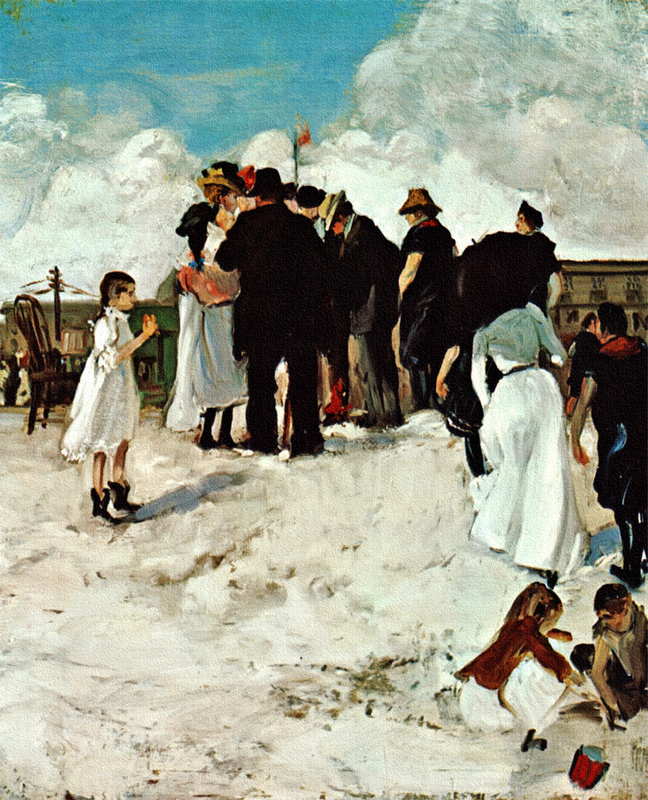 the painting was inspired by a scene on the beach in new york. maurer was highly influenced by james whistler, with the tones verging on being monochromatic with just accents of color. 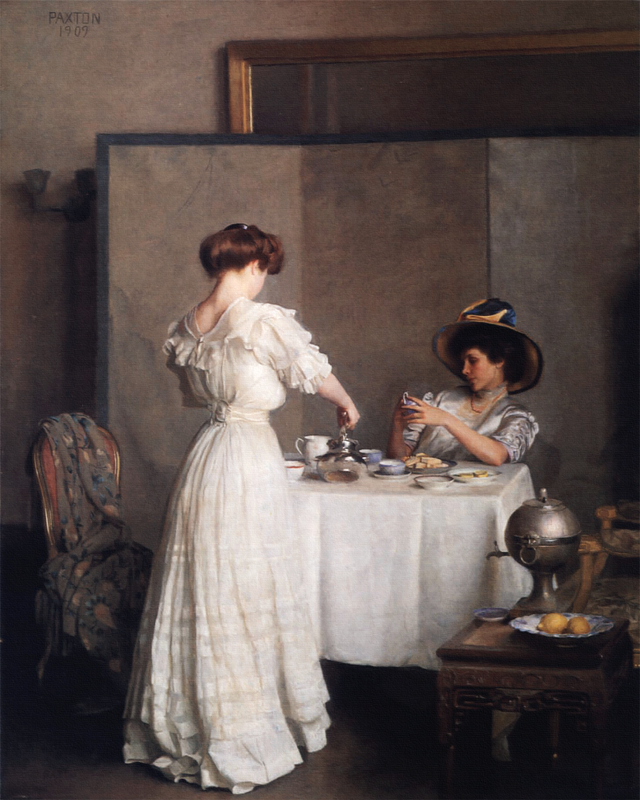 the first time i saw this painting i guessed it to be a whistler. i would have put one of whistler’s paintings up to day, but i don’t have a good print of one. alfred henry maurer (1868-1932) was also a transitional figure with some of his work having a strong impressionist’s influence, with others leaning toward the realistic. pure by william m. chase, c1888. pastel on paper. 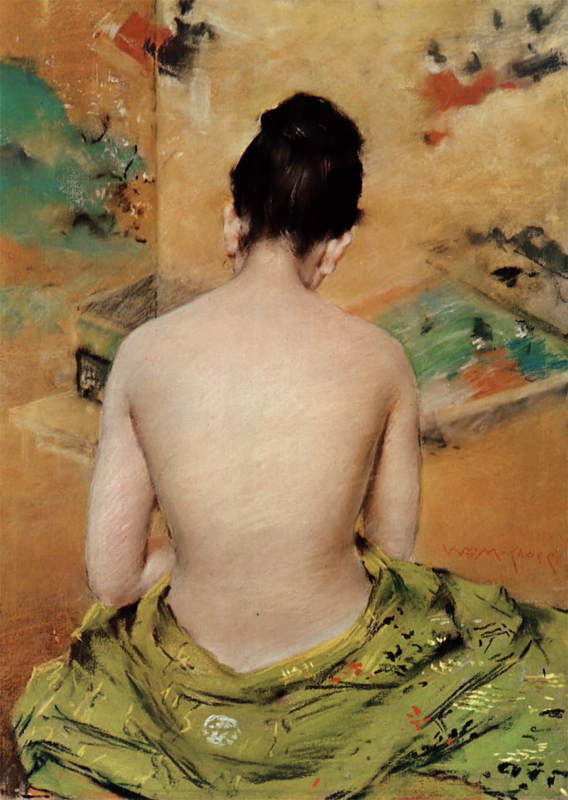 this pastel by chase, one of a series shows a kind of final break with the impressionists. it borders on being photographic rather than painterly. it also shows that like some paintings of mary cassat, the continuing influence of Japanese art with the Oriental design of the fabric. chase also did some paintings in the impressionist style. context and narrative… what is she contemplating. Ironically, voters had given Snyder and his cohort of right-wing corporate ideologues a spanking for this kind of nastiness in a November referendum. The GOP cabal in Lansing had conspired last year to usurp the local authority of city governments and allow Snyder to send in unelected, unaccountable autocrats to fire elected officials and seize control, but last month, Michigan voters overthrew this absurdity. This month, however, Snyder and gang doubled down on their dumbfounding, anti-democratic zealotry. With no warning, no hearings, no public input, no floor debate, and no time for citizens to even know what was happening, the same legislative czarists rammed a union-busting bill into law. Even though he had publicly rejected such a proposal earlier this year as being “very divisive,” Emperor Snyder gleefully signed this measure. Who’s behind this madness? Say hello to two infamous, anti-union, billionaire plutocrats: the Koch brothers. They had funneled as much as a million dollars into Snyder’s 2010 gubernatorial election, and three Michigan front groups funded by the billionaire brothers aggressively pushed the exact same anti-worker proposal that the Republican thugs just bullied into law. The social contract, that understanding where employers and politicians agree that workers are partners in making capitalism and democracy work, has been declared the enemy in the scorched earth policies of conservatives and libertarians. In the past various types of economic-government systems have been tried, from feudalism to colonialism to communism to various degrees of fascism. They all failed because they violated the social contract.